This entry was posted in Dentistry, Dentistry in the News, Practice News, Reviews, Share This Post, Why Choose Us? and tagged dentist, experienced, friendly, gentle, professional, relaxing, smile on 1 June 2015 by Dr Nishan Dixit. One of the great things about being a dentist in Harrow is that we get to meet the local people on a regular basis, and these lovely people very often leave reviews for us either on the website or in person at the practice. We’ve been asked by a few patients recently if we can put all of these reviews into one place and so here we are with a blog post. This patient was particularly nervous and was worried about some bridges that need to be made, after the treatment this was the review that this patient wrote for us. After searching for years for that Dentist that you have a great rapport with and that you can trust, we came across Dr. Nishan Dixit. We have been with him now for over 8 years and couldn’t be more satisfied. Not only is the quality of treatment we receive there great, but the friendly staff are more like an extended family making you feel comfortable at all times and —always providing a “reminder” call and doing their best to accommodate our busy schedules. A treatment that definitely exceeded expectations. Very happy with the results – Thankyou. I am normally terrified of coming to the dentist for any treatment but since having my consultation, I felt at ease and have found all my treatments very relaxing, and now have an amazing smile to be proud of ! Dr Dixit and all the staff at the surgery are so kind and professional. I’ve been coming to the practice for the last few months for treatment. The staff at the practice have been excellent, from the quality of the treatment to the after care support. I would encourage anyone to join the practice. Thanks Blue Court Dental. Adults wanting to straighten their teeth are a fairly new treatment group for dentistry. At our dental practice in Harrow we are pleased to work with 3 great systems for straightening teeth, Clear Braces, Six Month Smiles and Inman Aligner. 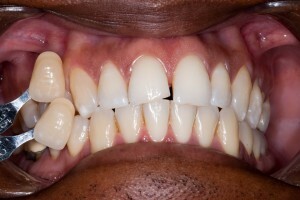 The Inman aligner is able to straighten teeth very rapidly and many patients tolerate it extremely well and indeed find it comfortable to wear. After about 13 weeks of treatment this patient wrote this wonderful review for our dental practice. I was very impressed at how fast the Inman Aligner worked. It was very comfortable to wear and very discreet. Taking it in and out was very easy . 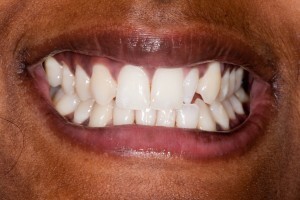 Dr Dixit explained the treatment to me very clearly and I was very happy with my teeth. When I smile now, my tooth does not hit my lip. We are fortunate that a few of our patients travel a great distance to come and see us. This really does allow us to know that treatment and dental care we offer in our practice is second to none. After travelling some distance to CS this patient wrote this review. We drive over an hour to get here which says it all. Always have great confidence and are treated really well. Of course the best reviews for any dentist come when our lovely patients right their reviews of live on the website. If you like to leave a review for our dental practice in Harrow please do so in the following box – thank you. This entry was posted in Reviews and tagged patient reviews, patient testimonials on 19 December 2012 by Dr Nishan Dixit. “After searching for years for that Dentist that you have a great rapport with and that you can trust, we came across Dr. Nishan Dixit. We have been with him now for over 8 years and couldn’t be more satisfied. Not only is the quality of treatment we receive there great, but the friendly staff are more like an extended family making you feel comfortable at all times and —always providing a “reminder” call and doing their best to accommodate our busy schedules. Very Very happy with the work done on my teeth recently . Bridge work was outstanding ! Will definitely recommend to others. Very good value for money. Thank you so much. Bluecourt Dental Centre is a local Harrow-based dental centre, to find out more about how we can help you with your dental treatment please request an appointment today. This entry was posted in Reviews, Share This Post on 12 October 2012 by Dr Nishan Dixit. My tooth looks like a clothes peg! Can you help me? This patient was very unhappy with her peg like tooth in her upper jaw. 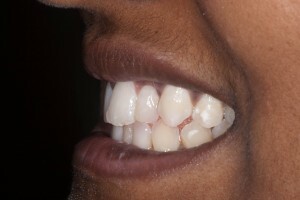 The tooth appeared smaller and sharper than the rest of her teeth and was very visible when she smiled. She wanted a more natural looking tooth with the least amount of tooth destruction possible. 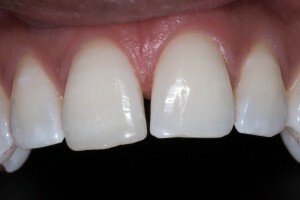 To change the shape of the tooth, a white composite filling material was used. 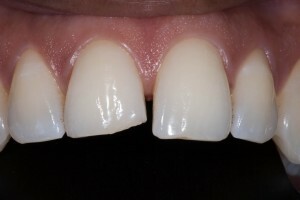 The filling was blended with the existing tooth using the latest techniques, giving the tooth a very natural look. The patient was delighted with the final result. 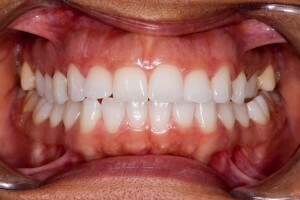 This entry was posted in Cosmetic, Dentistry, Reviews, Share This Post on 16 July 2012 by Dr Nishan Dixit. 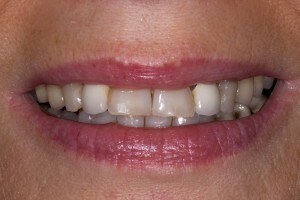 This patient came to Dr Dixit for a consultation because she was unhappy with her smile. 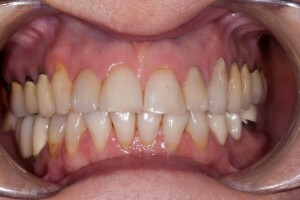 The front crowns that she had did not match the rest of her teeth and the black line near the gum was very visible when she laughed. 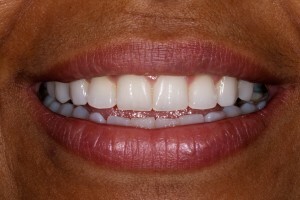 Dr Dixit decided to replace the old crowns with all ceramic emax crowns. 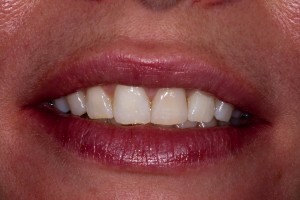 This was considered to be the best match with the patients own natural teeth. The transparent colour and life-like appearance ensured that it was unlikely to be noticed amongst her own natural teeth. 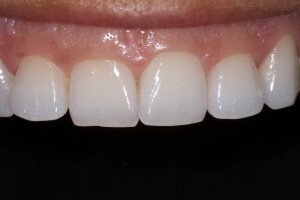 Emax crowns are a type of all ceramic crown with an appealing translucent colour which is combined with strength and durability. There is no metal alloy base which means no unsightly looking grey/black line. 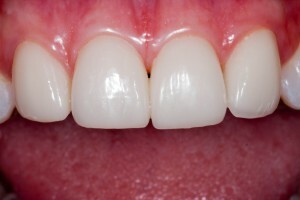 The patient was extremely happy and satisfied with the final result. I have been with this surgery for many years and have always had ” first class” treatment from Dr Dixit. The staff are very friendly and professional. 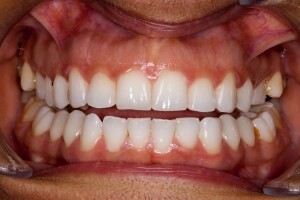 This entry was posted in Cosmetic, Dentistry, Reviews on 12 April 2012 by Dr Nishan Dixit. This charming lady was very unhappy with her smile and was seeking ways to try and improve it. 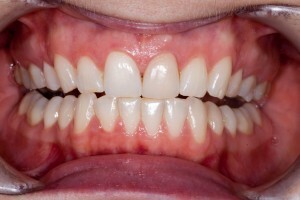 She wanted to lighten a discoloured front tooth that previously had been root canal treatmented. 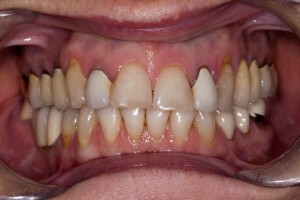 We decided that the least destructive way of improving the colour of the tooth was with a technique known as internal bleaching. 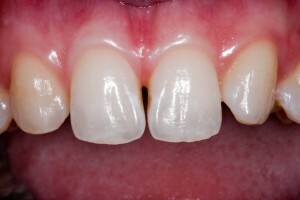 The existing filling on the back of the upper front tooth was removed and then a special whitening gel was carefully placed inside the tooth. This gel was applied repeatedly over a few days. She also had the rest of her teeth whitened. 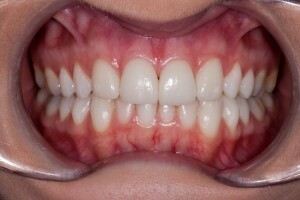 As you can see results were astounding, leaving her very happy with her new smile. “Last day of my whitening teeth treatment. The result is amazing. Thank you so much. This is such a great team and I just enjoy coming here. Never thought I would enjoy going to the dentist before! 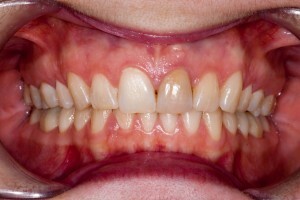 This entry was posted in Cosmetic, Dentistry, Reviews on 12 March 2012 by Dr Nishan Dixit. This very pleasant young lady from Harrow came to see Dr Dixit because she was unhappy with her smile. Every time she laughed she would raise her hand to cover her mouth. 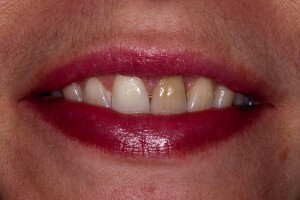 The gaps in between her front teeth had made her less confident and she thought the colour was uneven and dull. All she really wanted was a smile to be happy with. Treatment options were discussed with the patient and a decision was made. 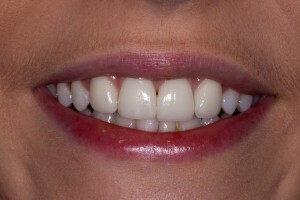 The teeth were whitened to get a brighter, whiter smile. 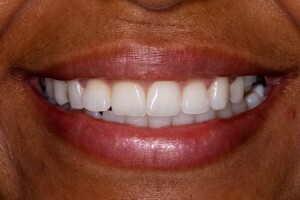 Minimum preparation veneers were made and fitted to close the gap and match the new colour of her teeth. The patient was delighted with the final result. She got the smile she always wanted. The patient is now bursting with confidence and is proud to show off her new teeth. 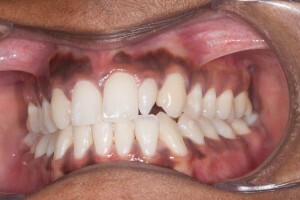 This entry was posted in Cosmetic, Dentistry, Reviews on 21 February 2012 by Dr Nishan Dixit. 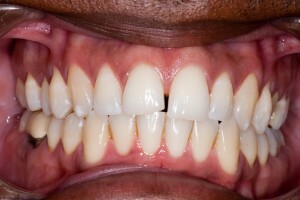 This gentleman from Harrow did not like the colour and appearance of his upper front teeth. His front tooth was chipped and he had some heavily filled teeth at the back of the mouth which were visible when he smiled. He also found that his teeth were too yellow. After a detailed consultation with Dr Dixit, treatment options were discussed. 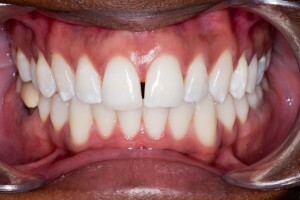 The patient decided to have teeth whitening treatment to improve the colour of his discoloured teeth. 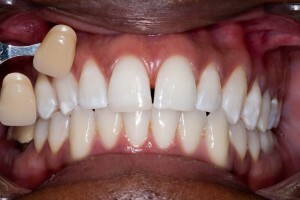 The chipped tooth was repaired using a tooth coloured filling material and the heavily filled teeth were protected with porcelain crowns to match the new colour of his teeth. The patient was very satisfied with the final result. 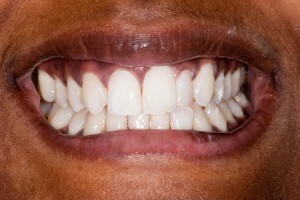 This entry was posted in Cosmetic, Dentistry, Reviews on 9 December 2011 by Dr Nishan Dixit. 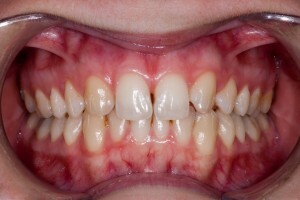 This patient from Harrow did not like her upper front teeth. 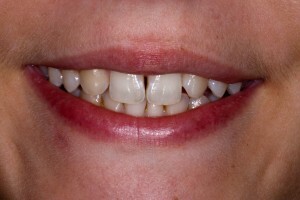 The two front teeth were slightly overlapping and one was protruding forward. Every time she smiled, her tooth hit her lower lip. 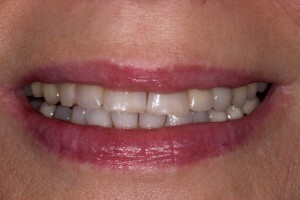 After discussing the treatment options with Dr Dixit, the Inman Aligner was the best option for her. The two front teeth were lined up together and the protruding tooth was pushed back. All this treatment took approximately 12-14 weeks. 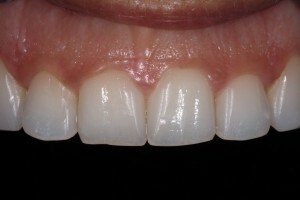 The patient was very happy with the result achieved. 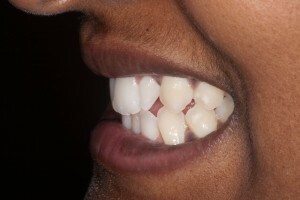 This entry was posted in Cosmetic, Dentistry, Orthodontics, Reviews on 13 October 2011 by Dr Nishan Dixit. I am a new client and from the moment I walked in the door, to a friendly welcome, I knew this was the place for me. The treatment I have received has been excellent and I have the utmost confidence in Dr Dixit. Such a friendly at home feeling ! 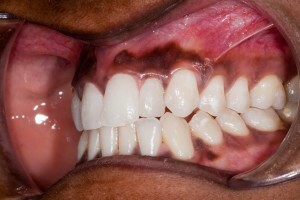 This entry was posted in Dentistry, Reviews on 23 August 2011 by Dr Nishan Dixit.